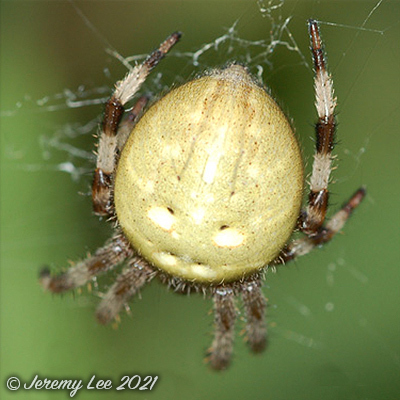 Females of Araneus quadratus, or the Four Spot Orb Weaver, can reach 17 mm in length, especially when gravid, the males approximately half that. They are quite variable in appearance, ranging from pale brown to bright orange or green, but they always have the characteristic four white spots on the abdomen. The legs are sometimes brightly striped. The spider lives in gardens, wooded areas, or wherever there is vegetation to string an orb web across. This species builds its web close to the ground to catch jumping insects such as small grasshoppers. The female builds the more elaborate web, complete with a funnel-shaped retreat off to the side where she goes during inclement weather. The web is smaller and closer to the ground than those of other species of orb-weaver. Adult females can actively change their color. It takes about three days to take on colors that accurately match their resting surface.